Today, the U.S. Geological Survey (USGS) and the U.S. Department of Energy (DOE), in partnership with DOE's Lawrence Berkeley National Laboratory and the American Wind Energy Association, released the United States Wind Turbine Database (USWTDB) and the USWTDB Viewer to access this new public dataset. This new Wind Turbine Database is a comprehensive dataset of U.S. wind turbine locations and characteristics that is easily accessible, more accurate, and updated more often than existing wind turbine datasets. This dataset and its associated viewer allow federal agencies to share data to properly develop and plan around wind projects. The availability of these data are crucial to planning for government agencies, as well as researchers. "This database and map are not only a fantastic and much-needed tool that will see much use, but also proof of the power of bringing together the expertise in both government and industry," said Tim Petty, Assistant Secretary for Water and Science at the Department of the Interior. "The data will help improve the siting of future wind energy projects as well as aid land managers in devising more up-to-date land-use and multiple-use plans." For example, the U.S. Departments of Defense and Homeland Security and the National Oceanic and Atmospheric Administration have been using the database already to perform crucial operational impact assessments of wind turbines on radar. This effort dovetails with DOE's interagency work to address the potential impacts of operating wind turbines on defense and civilian radar systems through the Wind Turbine Radar Interference Mitigation Working Group. "The Energy Department is conducting early-stage research to support development and testing to ensure that wind facilites do not interfere with our nation's radar systems" said Daniel Simmons, Principal Deputy Assistant Secretary for Energy Efficiency and Renewable Energy. "This database builds on those efforts and provides an important resource for other government agencies that use radar for their missions." "The USWTDB directly supports the North American Aerospace Defense Command (NORAD) air defense mission by enabling us to conduct credible and meaningful analysis of wind turbine-radar interference impacts, and ultimately helps ensure that U.S. renewable energy does not adversely impact our ability to conduct our homeland defense mission," said Major-General Christopher Coates, NORAD Director of Operations. Other examples of uses for the data include studying wind energy and wildlife interactions, reviewing economic impacts assessments of wind energy's deployment, and better understanding of local wind deployment trends. With the release of the database, data that were previously scattered across many datasets and in some cases unavailable to the public–have been released to the public in a single package via the USWTDB. The database currently contains data from more than 57,000 turbines, constructed from the 1980s through 2018, in more than 1,700 wind power projects spanning 43 states plus Puerto Rico and Guam. 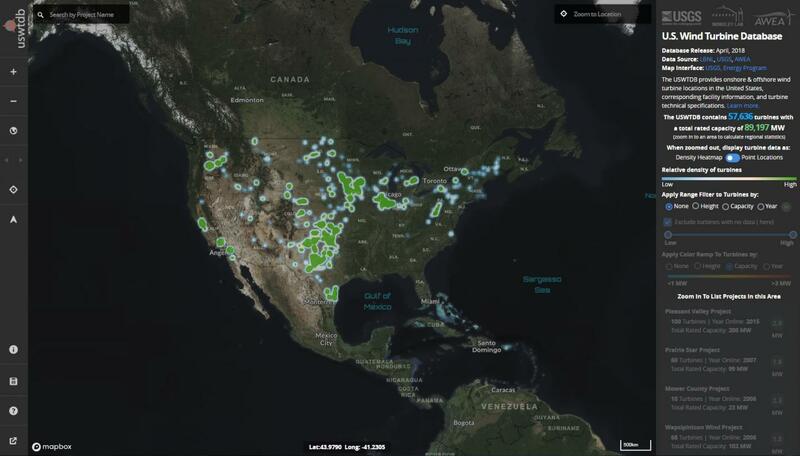 The USWTDB Viewer, the development of which was led by USGS Eastern Energy Resources Science Center, is unprecedented in its ability to search and sort the U.S. wind turbine fleet. Users can interact with the data using multiple filters and colorings to allow wind projects across counties, states or regions to be quickly scanned for unique qualities. The full dataset can be downloaded with a few clicks in a variety of formats, and users can connect to the underlying data and incorporate the Viewer into their own website. The database and viewer include wind turbine locations and characteristics, including make and model, total height, hub height, rotor diameter, year of installation, and rated capacity to produce electricity. The team that developed the USWTDB will host a one-hour webinar on April 23 at 2 p.m. Eastern to provide details on the data and viewer. To learn more about DOE's research in wind energy technologies, please visit energy.gov/eere/wind.